When a puppy or dog is unable to meet the strict requirements to become a Seeing Eye dog, they are called career change dogs and may go on to other important jobs such as law enforcement, therapy work or search and rescue work. Whitley is a career change dog who went on to become a loving companion to Zachary, an 8-year-old boy affected by disabilities since birth. 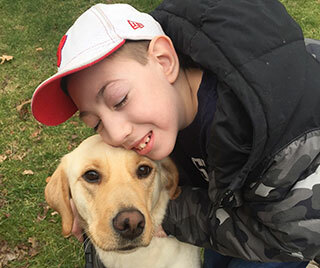 He told his family that he wanted a dog to be his friend, and in December, The Seeing Eye and Make-A Wish teamed up to make his dream come true. Zachary’s family travelled from their home in Pennsylvania to The Seeing Eye campus in Morristown, N.J. to meet their new family member. Whitley is a 2-year-old female, yellow Labrador retriever and golden retriever cross. She is exceptionally sweet and loving, and will give Zachary many years of friendship and devotion.